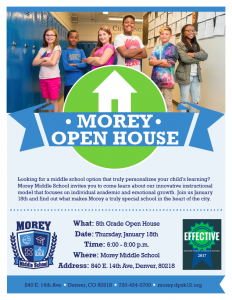 Morey Middle School – At Morey, we build on every child’s unique gifts so each person becomes a self-directed, socially conscious, educated member of our diverse community, both inside and outside of the classroom. Morey Neighborhood Center is very excited to be offering additional clubs! These clubs are open to the entire school – you do not have to attend MNC regularly to sign up for an individual club. PopCulture’s Creating Board Games: Develop your very own board game! Each session, we’ll play and discuss board games ranging from Monopoly to Settlers of Catan to Pandemic in order to learn how they’re made, then you’ll have the chance to create an original board game of your very own. By the end of the class, you’ll have a board game that you can play with friends and family! Mad Science Chemistry: Ooze into action, manipulate matter and witness some radical reactions in this exciting Chemistry-themed after school program from Mad Science! Slide down the colorful pH scale and dip into the science of acids and bases. Learn to recognize chemical changes and mix ingredients together for some sensational results. Make your own ooey, gooey Mad Science slime and other concoctions to take home! From proper use of equipment and lab safety to molecular structure and more, this innovative program explores the exciting world of chemistry for middle school students! Arts and Minds: We will create a group project to “Give Back” to our community. The children will guide this process and decide to whom we “Give Back.” Stay tuned for Family Engagement Opportunities throughout the Session. The last class will end in a dedication of our “Give Back” project, and Showcase of our Works. Stay connected to Arts & Minds through Facebook and Instagram to view snaps of your kids as they create with our incredible Teachers. Please reach out to Zach Goodwin at 303-229-6676 orZach_Goodwin@dpsk12.org with any questions! Couldn’t make it to the Student Supports at Morey parent presentation tonight? We recorded the whole thing, video and audio. Better set aside some time, though – it’s an hour long. Click below to get an extremely comprehensive view of how we support student positive behavior at Morey, from social-emotional supports to disciplinary measures to Multi-Tiered Systems of Supports. Morey is GREEN for 2017 School Performance Framework! This week, we were permitted to go public with our official rating of GREEN (Meets Expectations) for the SECOND year in a row. This is a big deal, since one year could be a fluke, but two years of Green status is a trend and a sign of a strengthening school culture. It is doubly meaningful for us, because schools in Denver Public Schools are now not allowed to be deemed Green unless there is strong evidence that those schools are closing academic gaps between racial and socioeconomic groups. Being rated Green means that there is a critical mass of students showing strong growth in every demographic and that we are indeed closing those gaps. We invite you to attend our School Performance Framework Community Meeting on Wednesday, November 8 at 6:30 PM in order to hear more details about our SPF, including bright spots, areas of focus, and specific plans moving forward, including our plans to reach Blue. Please click below for a basic overview of our SPF. Our parent-teacher conferences have been scheduled for November 1st and 2nd, from 3:30 to 7:30 PM and will be by appointment only. Please visit the links below to sign up for a ten minute slot for each teacher. If you need assistance, please contact Leah Prochnow at 720-424-0700.